Yes, I have been neglecting this space for the past week or so. I was so busy with my internship and stage managing for Woman Who Cooked Her Husband. After working day and night, I just tend to shut down once everything’s done to rest up. Anyway, that is not the point of this post. Just clarifying myself. Hahaha. 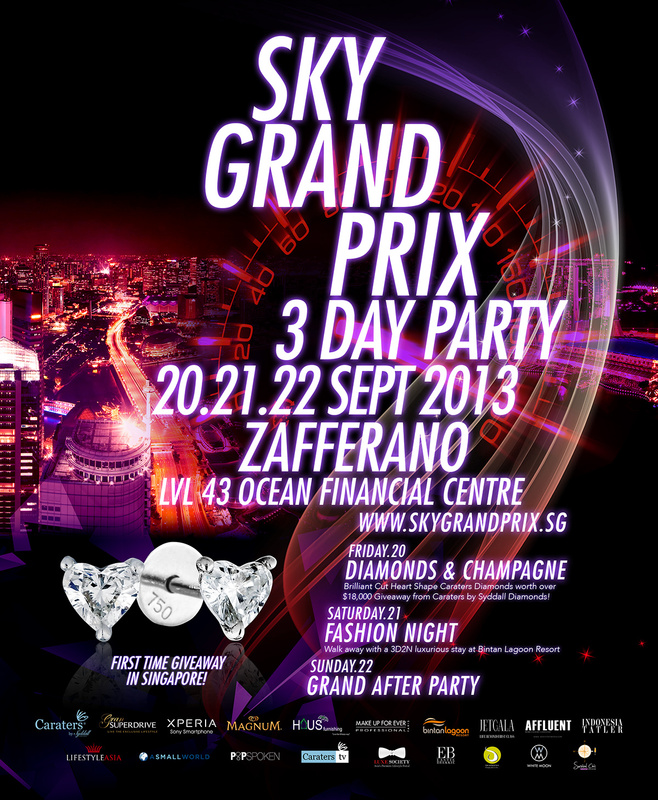 So, thanks to Fly Entertainment, I attended my first ever F1 event this year at Zafferano. I was really excited considering I have never been to Zafferano ever, and that I got to head out on a Saturday night after all instead of moping over the 1 World Festival cancellation. Situated on the 43rd floor of the Ocean Financial Building, 75 per cent of the entire F1 race could be seen and the lovely cityscape was definitely a bonus. Singapore is actually really nice to look at when the sun sets and all the bright lights start lighting up one by one. Singapore is a tiny sea of lights. I spent most of my time indoors with the drinks, air-conditioning and big screen to check out the timings of the various drivers and to keep up with the race. The place was pretty cosy with really modern decorations. I was impressed by the lights installed right at the centre of the space. It was really elegant and lighted up the whole place really nicely. However, I probably do not see myself visiting this place any time soon. Hahaha. Being expensive and really high-end, the event attracted mostly adults that are probably really well-off. And I felt slightly out of place because my dressing was really out of place. It also did not really help the situation that I had no make up on. So I could feel eyes on me and everything which made me a little uncomfortable but I ignored all those thoughts after a while. It helped that I had a friend with me and that we had a table entirely to ourselves so I had personal space to breathe and just enjoy the experience. With remixes of Taylor Swift, Adele and Daft Punk playing during the race, I was able to let loose and move to the music so that was nice. But once the race ended, the music started catering to the older crowd and playing more classics rather than pop so after a while of chilling, I left. But I definitely liked the experience as a whole. People watching, soaking in the experience of an entirely new environment that belongs to another class of people, moving to the music and just learning little things here and there. Looking at my background, I will probably never pay the money that was required to attend such an event so I was feeling lucky to even be able to be there. It was fun and a good experience. And after I left, I doubt anyone from that event actually remembers me until now. And it makes me laugh to think that their judgment sort of mattered to me when I was there. Just serves to remind me that as long as I am happy, that is how the memory will stay in my mind and that I am the one that essentially controls how I feel and react to an event. So yup. Even though I had some thoughts going in and out of my mind that night, the enjoyment never really left me. I was smiling, laughing and singing. And that was really all the mattered that Saturday night. And now, I know what I should wear if I ever get the chance to attend such an event again. Hahaha! So the next time, I can feel more comfortable among the crowd. Anyway, I was glad I got to watch the race live and that Jenson Button was in the top ten.